Ex-armed forces and Royal British Legion (RBL) members were welcomed to Patrick House in Leigh on Friday 9 October for the launch of Veterans Brunch – a new friendship group founded by Compassion in Action. 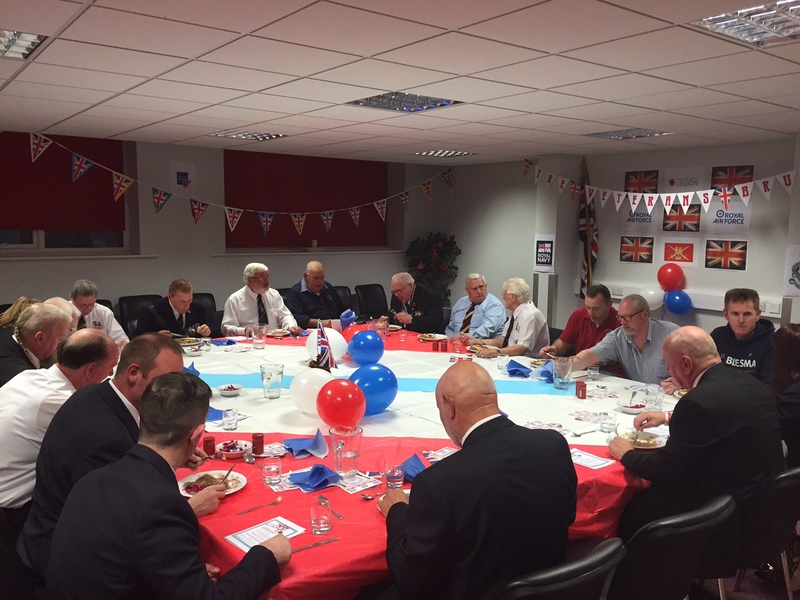 We reached out to Leigh-based veterans who have served all over the world in conflicts from the Second World War to the present day – inviting them to our headquarters for a hotpot supper. “Finding friendships… joining forces: that’s the aim of our Veterans Brunch,” says Pam Gilligan, our Chief Executive Officer. “Once a week we will be welcoming ex-armed forces members to join us at Patrick House for brunch and to socialise with other veterans. This group is for servicemen and women who may feel lonely or forgotten by the very community they have served. It’s a place of warmth, friendship and understanding for our local heroes who, as a charity, we have so much respect for. Patrick House was decorated in patriotic red, white and blue, with the Standards of each of the local RBL branches being united “for the first time in my lifetime” – as recalled by Leigh resident Keith Stott of the Tyldesley branch’s Welfare Committee. Bob Watson of the Leigh branch hopes it will help veterans to see what the RBL can do for them – everything from access to help with housing and benefits, to work opportunities and a social life. Atherton RBL branch member Roland Lawton praised the support the branch receives from the Royal Naval Association, and our “excellent facility” on Leigh Road. The next Veterans Brunch will be held on Thursday, 22 October. Food and drinks will be served at Patrick House from 11am ‘till 1pm. For any enquiries about the Veterans Brunch, please telephone 01942 418830.